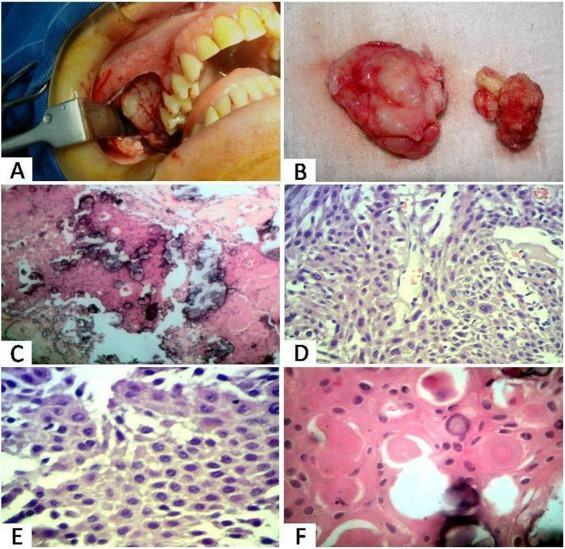 The calcifying epithelial odontogenic tumor (CEOT), also known as Pindborg tumor, is a locally invasive benign neoplasm. Histogenesis is controversial. A 26-year-old male presented asymptomatic swelling on the right side of the face, with approximately six months of evolution. At intraoral examination, a hard nodule localized in the right posterior region of the maxilla, measuring approximately 5.0 x 3.0 cm was observed. The computed tomography images showed hypodense lesion with points of calcification associated with two non-erupted teeth. We suspect of odontogenic lesions. The final diagnosis of CEOT was established based on the histopathological aspects.